It is time for the final square for Last Dance on the Beach CAL and completely fitting the beach theme the last square has lots of waves. The square for week 12 is designed by Tammy from Canadutch Crafts and is made using mostly slip stitches. Because of all those slip stitches, gauge is very important for this week. I combined a lot of leftovers this week to make the squares, all those half-balls that I know will otherwise be left unused. And because I can never seem to throw yarn away it will go back into my yarn stash and most likely stay there for a long time. So, to prevent beautiful yarn from not being used, I am using small bits this week. All of the colors are from my Merino Soft Dancing in the Sea, my Color Crafter Dancing in the Sea squares are still working solo-colored. Regarding hook sizes for this week, I used my ‘standard’ hook size this week. So I used the same hook as for my gauge swatch, which is a 4.5mm hook for my Merino Soft squares and a 4.0mm for my Color Crafter squares. But be ware; it can be hard to keep your stitches loose enough with all those slip stitches, so if you have a tendency to work a bit tight, you might want to go up a hook size. 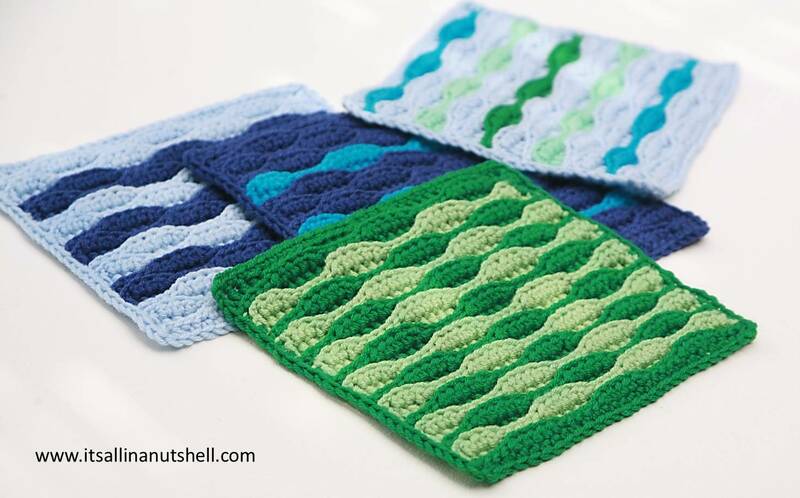 I also worked the waves in different color combinations. The square on the left is changing colors every two rows, the square next to it every four rows, the next squares has a combination of 3 rows in color A and 1 row in color B, and the final square has 2 rows in color A and then 1 row in a random color to use up smaller bits of yarn. For those of you that are left handed I have the video for week 12 available in English and Dutch. There are also available on the English and Dutch video pages. Again, please note that the English videos use UK crochet terminology. I hope to see you next week for part 13 when we are joining all of our 48 squares to make one blanket.